The Indian Ocean’s smallest and most exclusive paradise destination, an archipelago of 115, mostly uninhabited islands– is the archetypal tropical paradise and is now more accessible than ever thanks to British Airways’ new twice-weekly non-stop flights from Heathrow to Mahé. “This year is such an exciting time to travel to the Seychelles. There’s not only the new BA flights but also the new Four Seasons Resort Seychelles at Desroches Island, reached via twice-daily flights from Mahé to Desroches,” says Christine Kimbrell, Director of Sales & Marketing at SeyExclusive. Its stunning beaches are legendary but there’s plenty more on offer: diving and snorkelling, sailing, hiking, wildlife watching – even golf at the Constance Lemuria on Praslin, with increasingly varied accommodation to match. 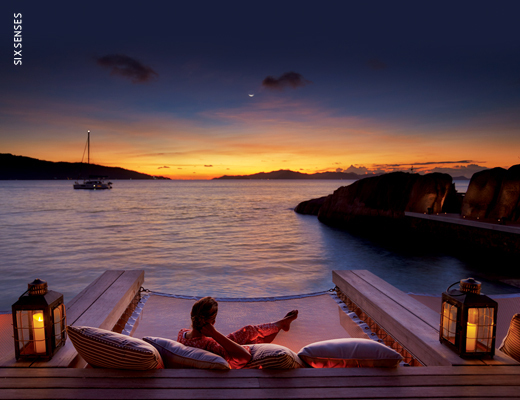 And while visitors used to fly-and-flop, island-hopping holidays are becoming increasingly popular, combining one or more of the three main islands – Mahé, Praslin and La Digue – with a private island resort. The key to up-selling this kind of multi-centre is getting across that each island has its own character and that visitors can have two or three very different experiences on one trip. While couples and honeymooners are still the main market (Prince William and Kate chose the exclusive, private island resort of North Island for their honeymoon in 2011 and the Four Seasons Resort Seychelles at Desroches Island is offering a babymoon package) operators are seeing a growth in the family market, with accommodation to suit everyone, from multi-generational families to groups of friends. The Alphonse Group belong to the Outer Islands of the Seychelles, around 250 miles southwest of Mahé. A new marketing brand, called Blue Safari, has been created to spread the word about the four islands: Alphonse, Astove, Cosmelodo and the Amirantes. Under the tag: “Where Experiences Are our Luxury” the concept will focus on exploring the lesser-known islands. Guests will be encouraged to partake in various conservation efforts to preserve the fragile atolls. Alphonse Island offers fun for all the family with Kids Haven operating a programme of activities that encourages the little ones to interact with nature and get involved in activities such as diving, snorkelling and fishing. Amanda Lang, Marketing Manager for Alphonse Island, said: “With miles of unblemished shorelines, lagoons and sea flats Alphonse is the Seychelles at its most authentic. With no airport and virtually no cars – just brightly painted ox carts to ferry visitors around – bicycle is the easiest way to explore diminutive La Digue. The sandy streets of this smallest of the Seychelles’ islands are just a 15-minute ferry ride from Praslin and well worth a diversion. I am cycling through the village of La Passe, passing shop signs that read ‘Open Some Days, Closed Others’, street stalls groaning under the weight of exotic fruits and a man carrying just-caught fish on his handlebars, on my way to the L’Union Estate’s historic coconut plantation. The palm-shaded path leads to one of the world’s most photographed beaches, Anse Source D’Argent, which is just one in a line of breathtakingly beautiful bays, flanked by enormous, smooth granite boulders that spill into the turquoise water. Later, I cycle around the northern tip of the island to Anse Banane and Chez Jules. There’s no menu to speak of but large platters of delicious Seychellois dishes just keep emerging from his simple kitchen: octopus in a delicate, coconut-milk curry, fish fillet in a rich Creole sauce. While I eat, Jules teaches me some Creole in his lilting accent, a hybrid of French, English and West Indian with its own distinct inflections. “Manze (eat),” he exclaims, urging me to use my hands. Flights: British Airways launches the only non-stop service from the UK on March 24, departing Heathrow Terminal 5 on Wednesdays and Saturdays, returning on Thursdays and Sundays. Hotels: Four Seasons Resort Seychelles at Desroches Island opens on March 1 2018. It is the only resort on the island. French group Club Med has taken over the Sainte Anne Beachcomber resort. Redevelopment is expected to continue until the end of 2019. Infrastructure: The reconstruction and expansion of Seychelles International Airport and the domestic terminal is underway and expected to be completed in 2019. Tourist office: The UK tourist office will run a six-person fam trip in the second half of this year. It is also taking its ‘Seychelles Discovered’ road show to Winchester, Buckinghamshire and Norwich from March 13-16, with the chance to win a trip to the Seychelles (more UK destinations will be visited later in the year). If Only… has seven nights in a Junior Suite at the Constance Ephelia in Mahé starting from £2,349pp half-board, with British Airways flights from Heathrow, private transfers and airport taxes.